Note: Part One is posted here. Q– Aside from the Trinity (which you’ve also written on), and Soteriology, what do you see as the most important and most misunderstood of the classic Christian doctrines? The Virgin Birth, the Atonement? Or something else? To seek for the most important and the most misunderstood simultaneously is very limiting. The union of those sets yields a very slender subset. Additionally, doctrines which are understood well in the academy may be widely misunderstood at the popular level. A– Hmmm… I would have to go with “original sin.” All sane theologians are going to agree that “all have sinned” apart from the Son—but how and why? Therein are many dubious theological tales. And in seeking answers, theological blunders from church history collide with complex modern questions about science and anthropology. Q – I’d like to ask about the central question raised by your book’s title: what is the difference, in your view, between salvation by works and salvation by allegiance? A– This is a good question, because otherwise it is easy to talk past one another. “Salvation by works” is a rather nebulous phrase. Each part can be probed. What is “salvation”? What are “works”? What sort of means or agency is intended with “by”? 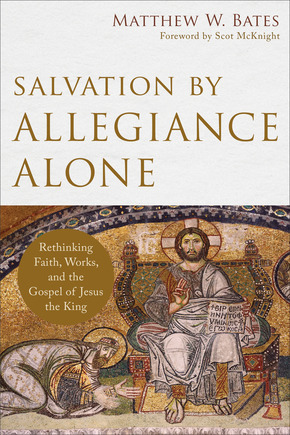 Meanwhile, since I am suggesting that allegiance is preferable to faith as the master-metaphor in contemporary English-speaking culture, what might allegiance involve? I think it is safe to say that for the majority “salvation by works” means a system in which salvation must be earned by performing certain deeds in order to achieve final salvation (usually conceptualized as “going to heaven”). An image that might accompany this popular view: God as the judge weighing deeds on a balance scale. If good deeds outweigh the bad, then a person is sent to heaven, but otherwise to hell. And so, salvation by works. In the history of Christianity (at the level of popular rhetoric), Christians of diverse stripes have accused Jews of having such a system, and Protestants have accused Catholics of such a system. Protestants have often made this charge against Catholicism, in fact, by asserting that Catholicism re-enacts the gospel-compromising error of Paul’s ancient opponents in Galatia. The claim is that Paul had to oppose justification by works in order to safeguard justification by faith, and Martin Luther (et al.) had to do likewise vis-à-vis Catholicism. However this caricatures both ancient Judaism and Catholicism. The work of E. P. Sanders, James D. G. Dunn, N. T. Wright, and many others on the New Perspective on Paul (NPP) has done much to correct this false portrait—even if the NPP hasn’t always described the Reformation correctly and even if there are elements in the NPP that need to be rejected or refined (for instance, in the book I disagree with N. T. Wright’s equation of “the righteousness of God” with “God’s covenant faithfulness”). Yet, with the NPP I take it as established that most ancient Jews believed themselves to be born by grace into saving covenant membership. They did not believe that salvation needed to be earned (in the sense described above), but rather maintained by performing the commandments while trusting that imperfect covenant performance could still result in the blessed age to come (as provisions for forgiveness and mercy can be found in the Law). Meanwhile, Catholicism also affirms the primacy of grace, believing that a person is regenerated and washed through baptism (that is, righteousness is imparted to the individual). But this baptismal righteousness, because it has been imparted to the individual, can be lost through subsequent mortal sin, so good works (participation in the sacraments) are necessary to maintain or renew that grace. Even non-mortal sins must be purified through penance or good deeds, which can happen in this earthly life or through obtaining an indulgence. Famously Luther protested because he believed this indulgence system to be utterly wrong and corrupt. When we go back to Paul, and read with care, I would argue that we discover several important truths: (1) Paul affirmed that the final judgment will be rendered at least in part on the basis of works (e.g., Rom 2:5-8; 2 Cor 5:10). (2) Paul’s polemic against “works” mainly intends “works of Law” or any similar system that relies on enumerated performance-commands. That is, Paul’s was not against doing good deeds in general, rather he opposed the idea that any form of worth (i.e., performing or not performing specific commandments) could establish one’s righteousness apart from being “in Christ”—especially since works of Law tended to divide Jew and Gentile and caused Jews to boast about covenant privilege. (3) The word pistis (traditionally “faith”) is not merely mental or psychological, but involves embodied activity. Accordingly ‘faith’ in Jesus the Christ is not reducible to trust in Jesus’s atoning power; it includes bodily allegiance to Jesus as the enthroned, ruling king.